Eating a healthy lunch can be a challenge. We get so swamped at work that we grab some quick and unhealthy fast food or skip lunch altogether, sometimes without even realizing it. I’ve forced myself to get in the habit of bringing my lunch to work with me. If I have lunch sitting in the office fridge, I’m less likely to overeat. And it’s a lot quicker to grab my pre-made lunch than figuring out where to order from. Plus, I seem to save more money when I bring my delicious leftovers from dinner. All in all, it’s not hard to see why packing a healthy lunch is key to living a nutritious life. The trick is getting in the habit of doing so, which takes a bit of recipe planning. While researching ways to make healthier versions of foods I love, I came across these Clean Eating Power Meatballs over at He and She Eat Clean. Instead of ground beef, this recipe calls for ground chicken or lean ground turkey. Choosing either of these options gives you lean protein to power through your day and keep you satisfied. As Fit Day notes, both options will run you between 125-130 calories per 3 oz. serving, with turkey taking the edge for fewer calories. But both will net you 26 g of protein in that serving, which is a fantastic way to keep you going. Plus, instead of using breadcrumbs, this recipe uses rolled oats. Since oats contain fiber to fill you up, you’ll be less hungry throughout the day. And if you needed yet another reason to dig in, oats are also rich in folate, omega-3 fatty acids, and potassium. 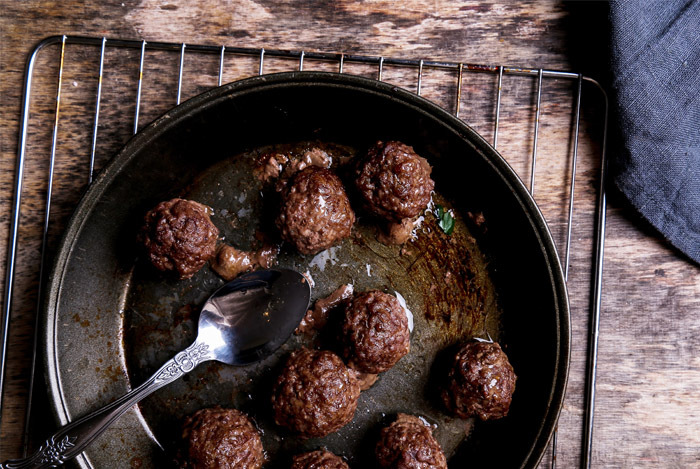 This recipe makes 15 meatballs so you’ll have plenty for dinner and lunch the next day. Pair this with some tomato sauce and whole wheat pasta or even quinoa and you’re ready to go. Preheat oven to 400F and spray a baking sheet with oil. Mix all the ingredients in a bowl and use your hands to incorporate them together. Shape mixture into 1” round meatballs and place on a baking sheet. Bake these babies up for 23 minutes or until the meat is cooked through. My love for eggs transcends just breakfast; I routinely make avocado egg salad on cloud bread for lunch and it’s an easy crowd pleaser for picnics. I also like taking a page from the Italians who eat frittatas morning, afternoon, and night. 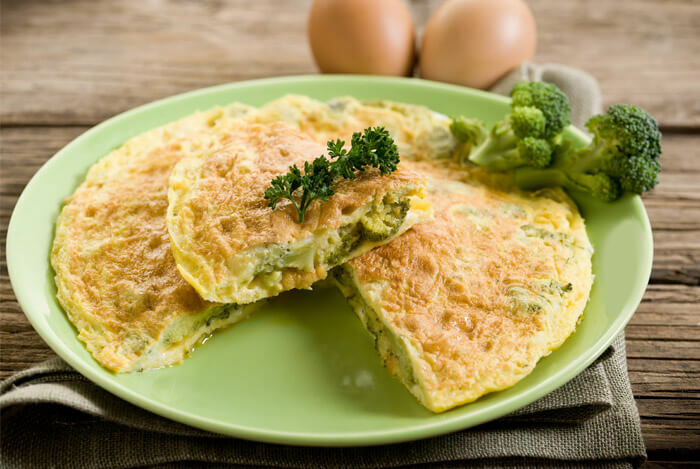 This light and fluffy frittata marries perfectly with warm, hearty soup, or big cold salads. I use Canadian bacon in this frittata. Adding in the peas and broccoli for a little bit of protein and fiber rounds out this super healthful lunch option. Saute the onion in a 10-inch ovenproof skillet with oil for about 3-4 minutes. Add the garlic and cook for another minute. Add the broccoli to the pan and cook until it softens, but remains crisp, just about 5 minutes. Add the ham and peas. Whisk eggs in separate bowl with milk. Add seasonings. Pour the egg mixture over the veggies in the skillet and stir. Sprinkle with parsley. Cook for about 1-2 minutes or until the edges begin to set. Place skillet in oven and bake for around 15 minutes, or until the frittata is cooked through. It’s hard to resist ordering take out when you’re in the middle of a hectic work day, but I promise that you’ll be way more excited to look forward to this homemade noodle lunch instead. Over at A House In The Hills, Sarah Yates Mora cooked up this soba bowl recipe that’s entirely vegan and gluten free. 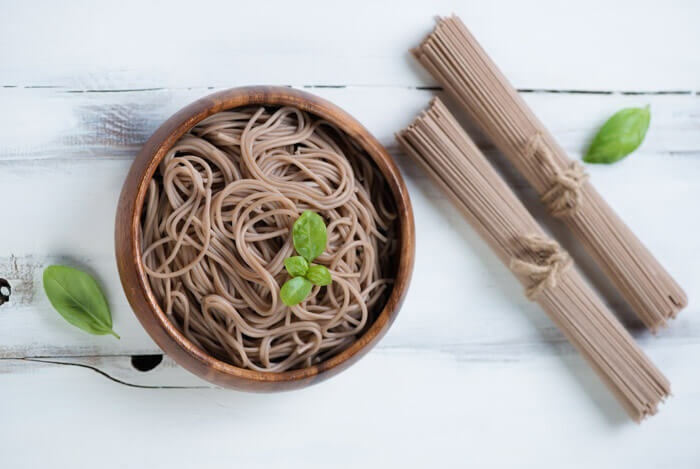 A little known fact is that soba noodles are made of buckwheat, which is an essential grain. But they’re also naturally fat and cholesterol free. Just one cup of these noodles gives you 6 g of protein for only 113 calories. This recipe makes about 2-3 servings, so you’ll have plenty to take to work for a few days. Trust me, you’ll need to keep yourself from devouring it all the first night you make it. Not only is this noodle bowl good cold, but it also heats back up well in the microwave too. Bring a large pot of salted water to boil. Cook noodles per package instructions, drain and rinse with warm water. Set aside. While the water is getting ready to boil, prepare the mushrooms and bok choy. Use a wet cloth to clean off dirt from the mushrooms. Trim the ends of the bok choy, wash thoroughly, and dry. To make the sauce: combine mirin, garlic, ginger, sesame oil, and 1 tablespoon of tamari. In a large nonstick saute pan, heat the butter with 4 tablespoons tamari. Add mushrooms to the pan and coat them in the butter and tamari. Leave them alone and let them cook on high heat for 6 minutes. Stir mushrooms after this time and cook for an additional 2 minutes until they’re brown, slightly crispy, and a little caramelized. Set aside. In a wok or larger pan, combine cooked noodles, sauce, bok choy, and mushrooms. Cook over medium high heat just until the bok choy is wilted. Garnish with sesame seeds. These spinach quinoa patties combine two of my favorite healthy staples together. I like this recipe from Cassie at Back to Her Roots because it’s so versatile. 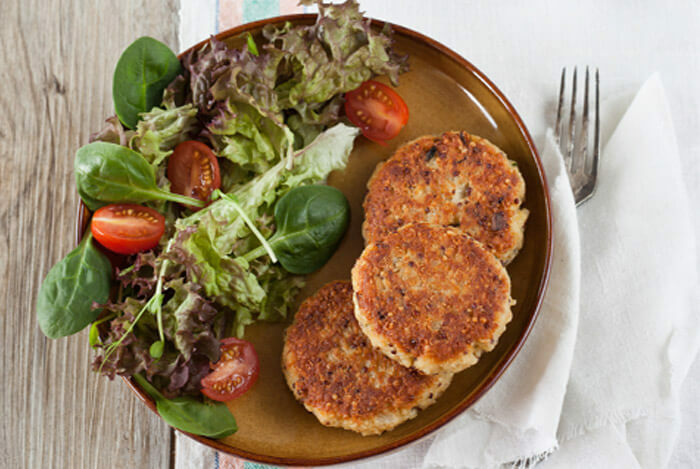 You can make small patties and toss them in a salad for protein or snack on them during the day. You can also form them into larger patties and use them as vegetarian burgers. Combine all the ingredients except the oil in a medium bowl and mix until well incorporated. You can add more panko if necessary to make sure the mixture holds shape when formed into patties. Let the mixture rest for 5-10 minutes to allow for flavor melding. Heat oil in a large skillet over medium-high heat. Form the mixture into small patties about 2” wide. Cook patties in heated skillet for 2 minutes on one side. Flip patties and cook for an additional 2 minutes. Both sides should be golden. Cool the cooked patties on paper towel lined plates. Not only is this salad nutrient dense and healthy, but the colors in it are so beautiful you may be too busy Instagramming pictures of it to want to eat it. We can thank Megan at With Salt and Wit for this recipe. 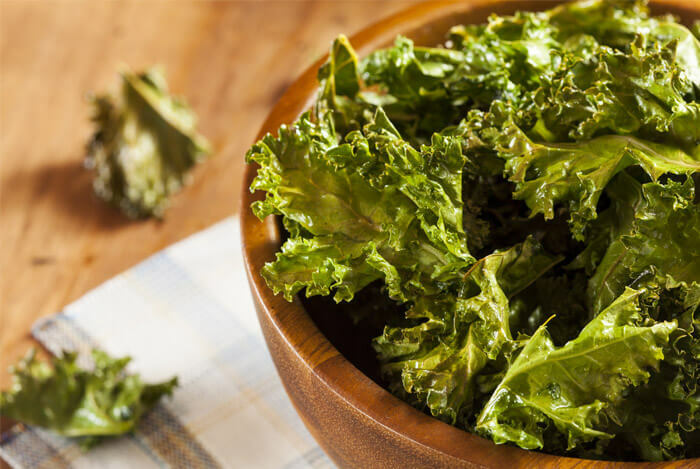 Using superfood kale as a base provides us with essential vitamins, minerals, and even omega-3s. Kale is also packed with magnesium. Your main source of protein in this salad comes from the chickpeas. One cup of chickpeas gives us 12 grams of protein. Toss kale, pepper, carrots, cabbage, broccoli, and chickpeas together in a large bowl. Set aside. Combine dressing ingredients in a small blender and mix until incorporated. When you’re ready to eat, pour about 2 tablespoons of dressing over the salad and toss. Top with cashews. These next two recipes feature avocado, a wonderfully healthy fruit I regularly praise. This salad wins the award for delicious simplicity. In fact, you probably have all the ingredients for this one in your pantry right now. Most vegetable salads rely on mayo as a binding ingredient, but not this one. By choosing to make your own vinaigrette, you’re adding healthy oil, lemon, and tangy Dijon mustard for flavor to the salad without adding a ton of calories. Did you know that cucumbers fight off sugar cravings and even boost energy levels? Both of those traits make me want to add cucumber to anything I eat in the afternoon, and they work perfectly in this salad. 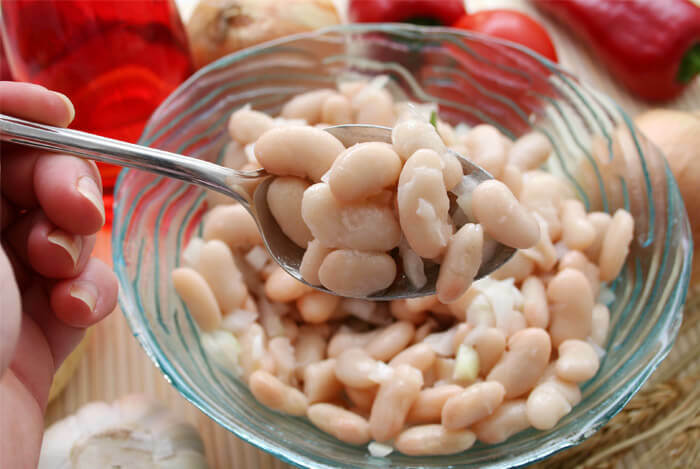 The cannellini beans in this salad give you 14 g of protein per cup, plus their fiber will make this salad seem ultra filling. You can always add chicken if you’re trying to get more protein in your diet. Prepare salad ingredients and place in bowl. Whisk the dressing ingredients together in a separate bowl and pour over salad. You make this salad in the morning and store it in the fridge at work, but if you make this salad the night before and keep it in the fridge overnight it will develop insane flavors. I love caprese salads; I can almost taste the juicy tomatoes, creamy mozzarella, and fresh basil right now. YUM. 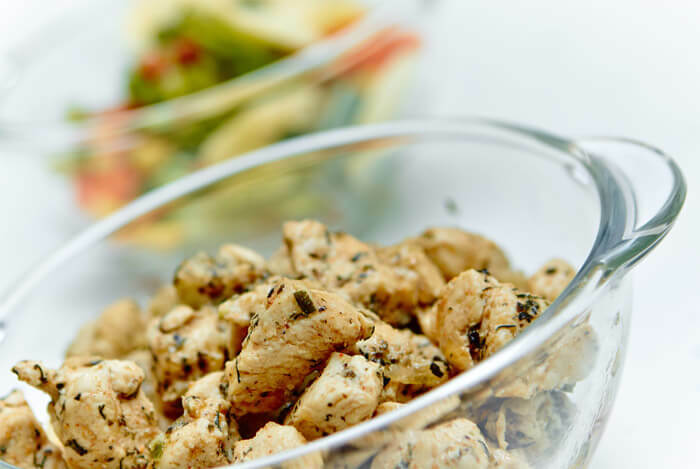 But caprese salads are not exactly power lunch material…unless you’re using this recipe from Joyful Healthy Eats, which adds lean chicken for a major protein boost. Bonus? It only takes 15 minutes to make two servings. Major score! To make the vinaigrette, mix garlic, dry basil, Dijon mustard, lemon juice, balsamic vinegar, salt, and pepper in a small bowl. Slowly add the olive oil and keep whisking until the dressing is well combined. Set aside. Heat a grill pan on medium-high heat and spray with cooking oil. Add seasoned chicken to pan and cook for 5-6 minutes per side, or until cooked through and there’s no more pink. When assembling salads to take to work, divide spring mix, avocado, tomatoes, fresh basil, and mozzarella in two containers. Let chicken cool before packing. Pack vinaigrette in separate container to keep salad from getting soggy during the day. All of these recipes have lean protein, healthy carbs, and tons of vegetables. By combining these ingredients, you’ll have perfectly healthy, power packed lunches to keep you going and satisfied until dinner.